We are a certified partner and we keep that status in good standing. But we don't use it as our core platform any longer. It's important to disclose that we work with many other technology and other solution partners/companies and remain agnostic in delivering these solutions to clients. Buyer beware. Be prepared to invest many hours if you plan to manage this application yourself. This is true of any automation solution. Can you take classes and go to University again and become a great marketing automation expert yourself? Yes, probably. But should you be investing your highest and most productive use of time building out Infusionsoft. Not likely.Which means you need to plan on finding someone you can trust and that is the plain truth. There are many qualified consultants who have sufficient sales, marketing, business, content, life and Infusionsoft experience to help you get results. But far too many people decry this as an all in one solution that is easy to use. This will never be the case even though the product development team is constantly working to make it a better product and easier to use.We don't make our own paper clips for a reason. We outsource all the time. We have to make really informed decisions on the solutions we use and then commit to learning best practices for marketing regardless of the platform.Do not expect to pay someone less than $150-$250 per hour to really make this application sing. Or pay them for training or internal services and then kick yourself. Haven't experienced any real issues with availability. Reliability is another deal. OMG, it's all in one and that compromises everything, fundamentally. If you want a race car, invest in a race car. If you want a dune buggy, get that. If you want a boat that floats, go for it. Again there is so much online support that users can find on Infusionsoft. From the corporate website and call center, to users groups located around the country, and ICCs who provide online resources, coaching and more, finding support for Infusionsoft is an easy task! This training is taught often to the lowest common denominator so as to help as many customers of theirs as possible. We do the training and coaching and implementations for our clients. But clients who I know who have been to their training get trained well. The gap that can exist lies in you doing your part and really investing in using and building out the application.The training and education is only as good as your willingness to apply it. If you're willing to click and learn as you go, there are great resources for training including on page help and video. Don't let the fear of implementing a new software solution keep you from unleashing the power of automation that Infusionsoft provides. With the right implementation partner, the process can not only be smooth and painless, it can actually help you get a better understanding for how your current communication process can be improved upon. The others are not trying to be all things to all people. The others don't pretend their solution is the end-all-be-all to save small business owners. They are not all in one and don't pretend to be, regardless of the price points, from lower to higher. We used Infusionsoft because I, as the owner of the company, was willing to invest hundreds of hours learning and using the system. Plus, I paid out thousands of dollars over the first several years for others to help me integrate it with our marketing campaigns because I am not a programmer and never will be. I enjoy doing this kind of work on top of the coaching and advising I do for a living. Then I made automation and content marketing a natural extension of my business. It complimented by business model, until recently, when we found a better solution that does not try to be all things to all people and save the world. Pricing is user and email and function based. Way too many pay walls and not native function for scaling. It's scaleable with NASA level marketing automation talent you must pay to engage. Otherwise, it gets expensive quickly for scaling to a true small business, which is what they target. Over 25 users and you're screwed. Look at the competition first, evaluate what you really need for your business and start there. Keep it simple, build your cash flow and confidence in the people you hired to make this work and then scale. Don't get sucked into the dream that this thing will help you sell your book to millions and you get famous while hanging on your boat or whatever. Building a small business is hard enough. Adding software often adds complexity in order to successfully scale. Infusionsoft has saved valuable time for our sales staff in contacting and following up with flaky leads. Infusionsoft prevents any of our 70+ new monthly clients from falling through the cracks. Infusionsoft is one of the biggest bills we pay monthly. 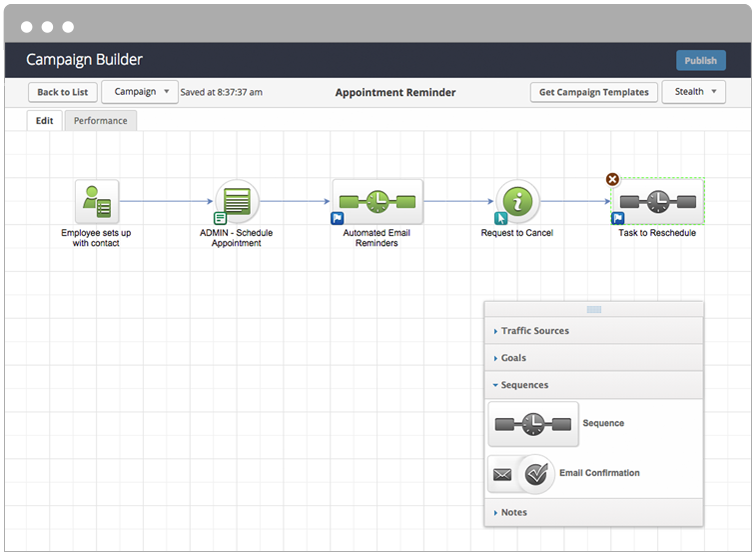 Infusionsoft Marketing Automation - Automate Email Marketing tasks and use advanced segmentation and personalization to deliver customized email communications to your customers and prospects.